LIQUI MOLY manufactures oil treatments and additives to optimise the productivity and performance of industrial machinery, as well as minimise downtime, breakdowns and maintenance costs. LIQUI MOLY Pro-Line Engine Flush prolongs engine service life and thoroughly cleans oil systems. The cleaning additive is always added to the engine before an oil change. Its active ingredients dissolve dust particles and ensure that they are drained off with the oil. The fresh oil is filled into a clean engine crankcase where its full performance will be achieved. Transmission / drive train oil (TDTO) is a versatile lubricant but requires short oil change intervals. LIQUI MOLY’s specialised final drive and axle oils (FDAO) are suitable for transmissions without wet brakes. FDAO change intervals are twice as long as TDTO, and are designed to enhance the performance of axles, differentials and final drives. The formula of LIQUI MOLY Longtime Grease C2LP is based on calcium soap, and has very high adherence and load bearing capabilities. Designed to protect standard grease from acidic water, its water-repellent properties help to prolong the lubricating film on the surface and resist machinery wear, especially at pin joints. High-sulphur diesel fuel creates sulphuric acid during the combustion process in the engine. 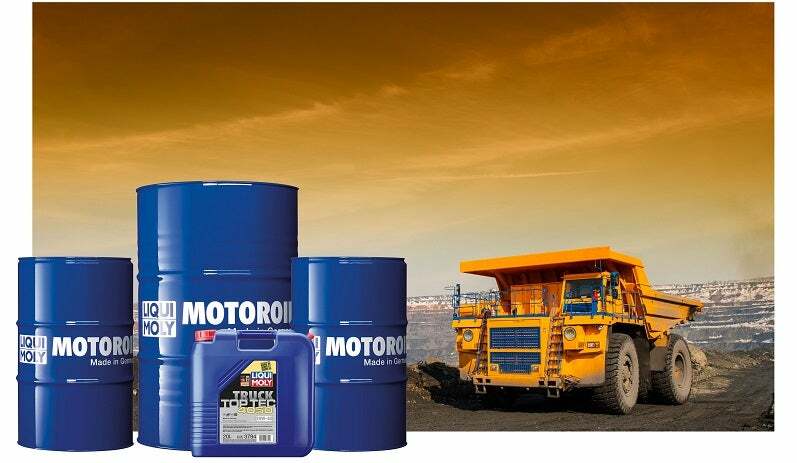 Engine oil additives neutralise acid to prevent corrosion, but their neutralising capabilities are limited. Oils by LIQUI MOLY with high total base number (TBN) offer a higher acid protection and significantly prolong oil change intervals. Debris in the drillings of injectors gradually prevents diesel fuel atomising into a fine spray. An irregular spraying pattern reduces power and torque, as well as increases fuel consumption. When added to vehicle tanks or filling stations, the concentrated LIQUI MOLY Pro-Line Super Diesel Additive K removes harmful deposits, protects the fuel system from corrosion, boosts engine efficiency and extends the service life of injectors. The additives in hydraulic oil get used up over time, reducing performance and resulting in brittle seals, stick-slip and increased wear. LIQUI MOLY Hydraulic System Additive refreshes hydraulic oil, as well as extends its service life, decreases its temperature and protects it against foam, sludge and corrosion deposits. LIQUI MOLY has more than 50 years of experience with producing additives. Made exclusively in Germany, it is the country’s most popular motor oil brand. The company gained great attention at the BAUMA CONEXPO in South Africa in 2015, where it introduced its smart maintenance solutions for the construction and mining industries. LIQUI MOLY's core business is cars. The majority of the company's turnover is generated from engine oils and additives, along with maintenance and service products. Over 50 years of experience has gone into producing their product range for general aviation aircraft, which became commercially available over a year ago. The development of ultra-modern engine technology and oil change intervals of up to 150,000km in the modern truck sector would be inconceivable without advanced high-performance lubricants. The lubricant 'engine oil' is an integral component of the engines currently costing between €10,000 and €20,000.